Echinacea is an adaptogenic stimulant to the immune system, affecting a variety of viral and bacterial conditions. It is used as the first line of defense in resisting disease by strengthening and potentiating the immune system. The herbs in this compound include properties that are cortisone-like, produce anti-tumor activity, and increase production and activity of various components of the immune system. Suggested in any instance of a weak or compromised immune system. Especially helpful for those individuals with low resistance to viral and bacterial infections and those slow to heal. Specifically indicated as an immune supportive therapy in treatment of allergies, infections that are fungal, viral or bacterial in nature, and chronic disease such as cancer and AIDS. OS-20 comes in 1 oz. (30ml). Using 30 drops per day this bottle will last about 1 month. Acute: 15 to 20 drops in water, two to five times per day until the imbalance has cleared. Chronic: 10 to 20 drops in water, two to three times per day. Continue treatment six days per week for six weeks. Stop the drops for one week and then repeat the cycle. Depending upon the condition, use of this compound may be necessary for one to six months. Do not substitute this compound for qualified healthcare. AIDS, cancer, or any condition involving high or persistent fever or pain needs appropriate healthcare and supervision. By incorporating Ultra-Disks into any treatment we quickly balance the natural meridian flow thereby enhancing the entire treatment. Generally, you can use the 15mm Micro or Ultra-Disk for all applications. 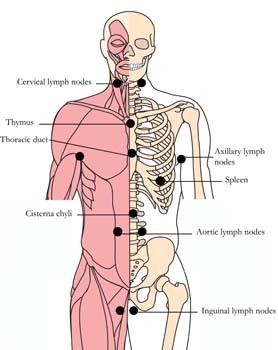 Locate the Cell Points as described below. Determine which Cell Points are the tenderest. Liberally apply Panther Juice to these points and allow to dry thoroughly. Using Cell-Dotts or surgical tape, adhere the Micro-Disks to the desired point. It is very important to cover the entire spot. 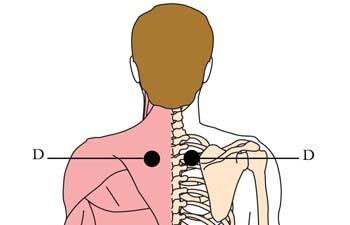 Location: Cell Point A is located in the hollows directly below the protrusions of the collarbone. Benefits: Strengthens the immune system as well as relieves chest congestion, breathing difficulties, asthma, coughing, anxiety and depression. 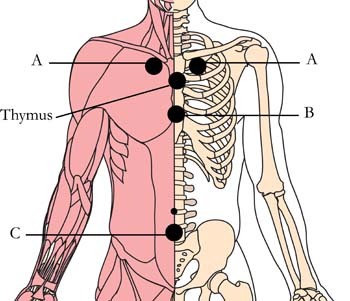 Location: Cell Point B is located on the center of the breastbone, three finger widths up from the base of the bone. Benefits: Relieves anxiety, anguish and depression. Boosts the immune system and regulates the thymus. The Thymus is located two to three fingers widths below the collarbone. Location: Cell Point C is located two finger widths below the belly button. Benefits: Strengthens the condition of the immune system and the internal organs. Benefits: This particular Cell Point governs resistance, especially resistance to colds and flu. Application: Liberally apply Panther Juice to the area and allow to dry completely. Adhere Micro-Disks with Cell-Dotts™. Duration: Start Cell Point application when you begin using OS-20. Continue wearing the Micro-Disks for two to three days after symptoms have cleared. Reapply at the first sign of imbalance. For Tachyon trained individuals, incorporating TLC Bars on the TLC balancing points below represents the ultimate treatment combination. TLC bars are reserved for Students of Tachyon Holistic Wellness courses or LWL courses. Typical Balance Session: Using your TLC Bars, charge each point for 30 seconds energy in. Reverse the flow for 30 seconds energy out. Finish with 30 seconds energy in.